As a safe and effective method of abrasive cleaning, ARMEX™ blast media offers numerous advantages. Its benign, sodium bicarbonate based formulation provides enhanced worker safety, comfort and efficiency, and is appropriate for use in a variety of industries: manufacturing and remanufacturing, food and beverage, fire and mold remediation, restoration, automotive, medical and more. Its environmental profile also fits well with the sustainability plans maintained by many corporations. 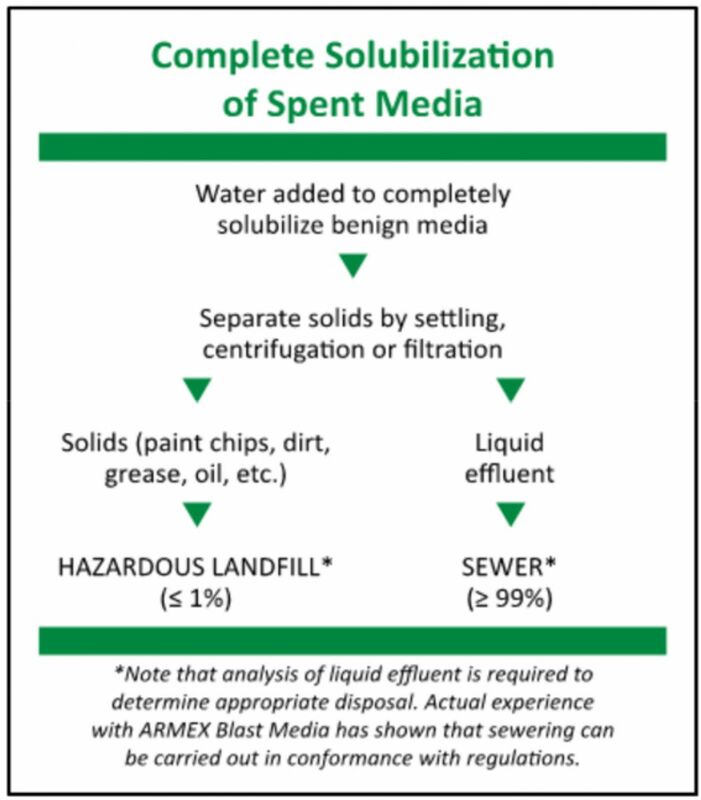 The disposal of spent ARMEX™ blast media waste is less costly and complex than waste disposal for other abrasive medias. On its own, ARMEX™ blast media is water‐soluble, non‐toxic and environmentally friendly — and is the only type of abrasive media that can be disposed within a traditional waste stream. Of course, customers should always check state and municipal guidelines for disposal, as well; regulations may vary considerably, depending on locality. The blast method used has an impact on waste disposal procedures. Dry blasting using compressed air within a cabinet or blast pot typically results in a minimal amount of contaminant within the byproduct. If the contaminant is under a certain ratio (as determined by state and municipal guidelines) it can simply be vacuumed and disposed within the traditional waste stream. If water is added to dry byproduct, it can also be solubilized in the same way as wet byproduct. Wet blasting methods offer the advantage of reducing dust, but also require runoff to be collected. If collected into tanks, dissolved soda plays a beneficial role by lowering water acidity. Significantly less water is involved in vapor blasting, a wet abrasive method on the rise that combines compressed air and water into the blast stream. For all methods involving water, spent media can be either partially or completely solubilized. With partial solubilization, no extra water is required. After separating out solids from the blast system output by settling, centrifugation or drying via evaporation, the spent media gets broken down into two components, at an approximately 50/50 ratio: unsolubilized material, including benign ARMEX blast media and solids such as paint chips, dirt, grease and oil; and the remaining effluent, which is solubilized media and water. Generally speaking, the unsolubilized material (greater than or equal to 50 percent) can be dewatered or dried and disposed by sanitary landfilling. The remaining liquid effluent (less than or equal to 50 percent), with the prior approval of the waste treatment plant, can be disposed in the municipal sewer system. With complete solubilization, additional water beyond the normal blast system output is required. 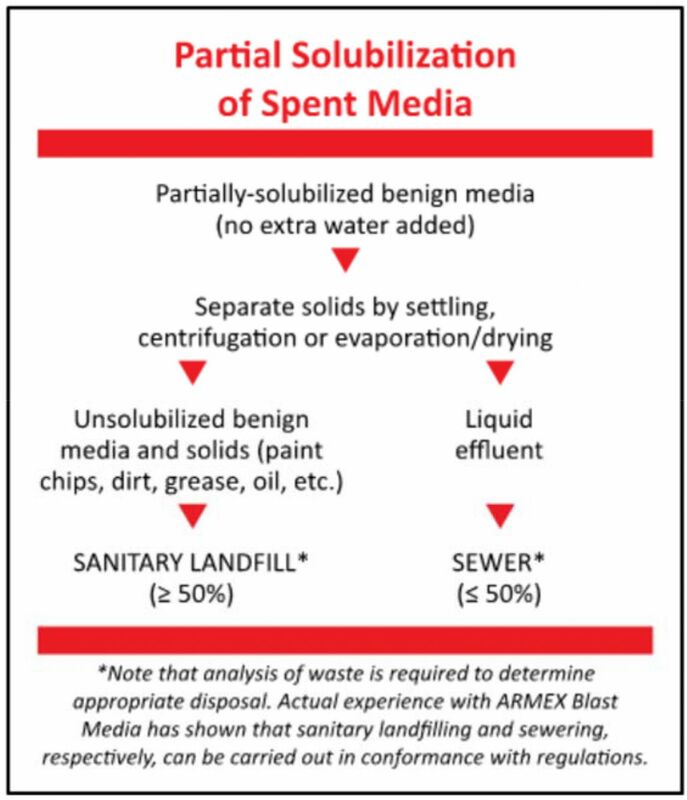 After separating out solids by settling, centrifugation or filtration, this method typically offers the advantage of allowing all of the spent media — in the form of solubilized media and water (greater than or equal to 99 percent) — to be sewered, with the prior approval of the waste treatment plant. The leftover undissolved solids, however, must be disposed in a hazardous landfill after filtration. Efforts must always be made to dispose of waste properly. The non‐toxic properties of ARMEX and the nationwide availability of waste consultation from a company such as Clean Harbors/Safety‐Kleen are designed to make that job a lot easier, allowing businesses to put primary focus on the task at hand.